This is my new graphic novel or long comic. It is 148 pages, black and white, with colour covers. It is halfway between A4 and A5 in size. Free postage in the UK! The first couple of parts of Corporation Pop were to be found in Jackson’s not entirely successful Rhizome anthology, where they were the definite highlight. Here those first two parts have been redrawn and form just the very first few pages of this near 150-page graphic novel. It’s just bizarre. But it’s brilliantly bizarre. So many of Jackson’s comics have been. There’s something about his writing that almost defies categorisation, he’s continually shifting genres, always with a canny knack of the deadpan humour coming through. And so it is here. 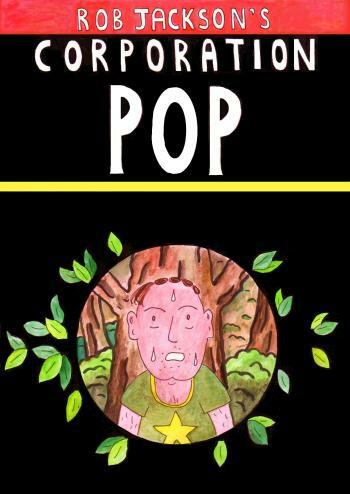 Corporation Pop (as in water) is a very, very strange thing. Poor Dan Smith, well, poor the man I came to think of as ‘my Dan Smith‘, or maybe ‘our Dan Smith‘, because when Rob Jackson really starts to get going the versions come so fast it’s practically dizzying in the iterations. Our Dan Smith finds that first doppelgänger meeting merely a first trip into a whole rabbit warren of confusion, a bizarre, unsettling thing, where he finds his dreams full of confusion and foreboding and his reality worse. Suddenly there are Dan Smiths coming out of the woodwork, and the sense of extreme paranoia is palpable, as scary as it is ridiculous. Rob Jackson’s comics have always had that sense of ‘just go with it, it will be worth it, about them’ and that’s here in spades. There are twists and turns that are, on one hand, absolutely ridiculous, but on the other are wonderfully surreal. So, it’s a secret conspiracy. It might all be down to Dannington, Evil Dan… or perhaps, like the very similarly looking Doctors tell him, it’s all just “paranoid narcissistic delusions”. Which is simply surreal in it’s ridiculousness, isn’t it? And it’s a book that does this brilliantly well, mixing in a completely over-the-top idea, loads of twists and turns, equal parts Mission Impossible, The Man From UNCLE and something very British in it’s comedy, comedy that’s incredible good at times and utter what the hell was that at others. Yep. Well that really takes root later on. Maybe it’s one (or twenty) twists too many, maybe it is a troublesome end, maybe it’s me. Whatever it is, there’s a fascination and glory to what Jackson does, and a real sense of adventure when reading his comics, both on the part of author and reader.. The strange structure, the unusual, naive even, artwork, the complete refusal to stay in any one genre, all of it comes together in something very good. But maybe a third too long. Tighter and shorter might have won the day. As it is, Corporation Pop is a glorious try to do something very different.